From left: Murray Westley, 412th Civil Engineer Squadron director; Gwyneth Bown, 412th Force Support Squadron Child and Youth Programs Flight chief; Colleen Evangelista-Weeks, 412th FSS; Kristen Burks, 412th FSS; Brig. 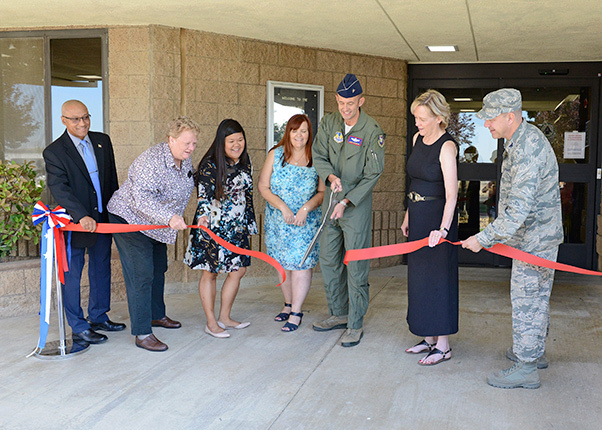 Gen. E. John Teichert; 412th Test Wing commander; Janice Hollen, 412th FSS director; and Col. Jeffry Hollman, 412th Mission Support Group commander; cut the ceremonial red ribbon to officially reopen the School Age Annex Aug. 15. Children at Edwards Air Force Base in California have a newly renovated place to spend quality time before and after school. 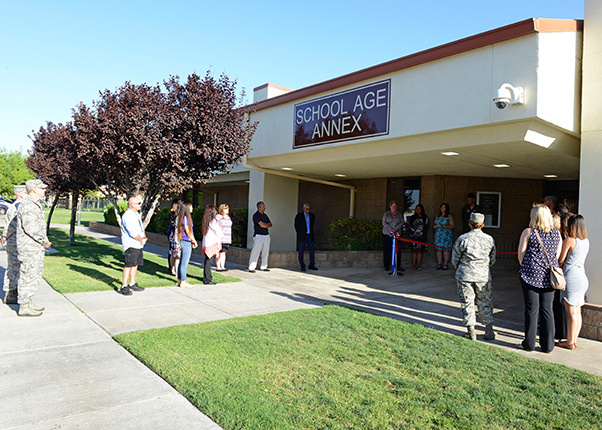 Team Edwards celebrated the reopening of the School Age Annex with a ribbon-cutting ceremony Aug. 15. Brig. 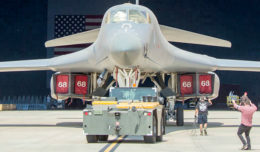 Gen. E. John Teichert, 412th Test Wing commander, took hold of the oversized ceremonial scissors and cut the red ribbon alongside 412th Mission Support Group, 412th Force Support Squadron and 412th Civil Engineer Group leadership and staff. The renovation project began in January and finished a month early, according to staff members. The completion of the $1.2 million project is the culmination of an effort between the 412th FSS, 412th Civil Engineer Group, U.S. Army Corps of Engineers and Larco Development Inc. 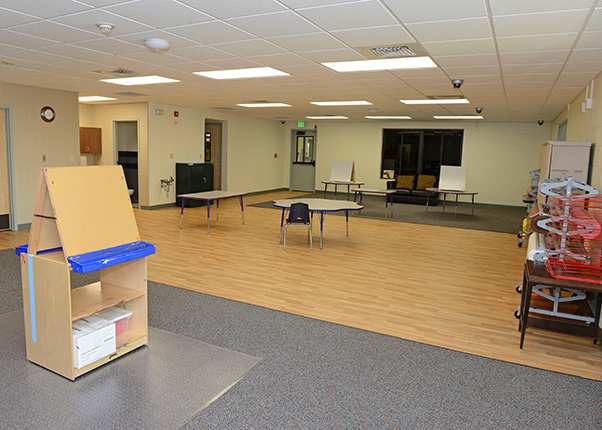 The newly renovated School Age Annex features this refreshed activity room that will be used for arts and crafts. The annex is open to students before and after regular school hours. Upgrades include new flooring and carpeting, furniture, painting and a brand new kitchen for making meals and snacks. During his remarks before cutting the ribbon, Teichert stated his number one priority is the safety of his workforce and their families. He extended his thanks and appreciation for all of the people involved with creating a upgraded, safe place for the base’s children to play and learn. The School Age Annex is in Bldg. 6459 off of Fitz-Gerald Blvd. and is open to students from first through sixth grade. Activities offered include art, music, science, math, reading and outdoor activities. Programming also includes club activities such as 4-H and Boys and Girls Club. For more information, call the School Age Annex at 661-275-PLAY (7529). Base students return to school Aug. 20. The recently renovated School Age Annex is located on Fitz-Gerald Blvd. in Bldg. 6459. Before and after school activities are offered to students from first to sixth grade.